Less than a fortnight after being consecrated Bishop of Meath, Dr Tom Deenihan is leading his diocese’s 71st pilgrimage to Lourdes. 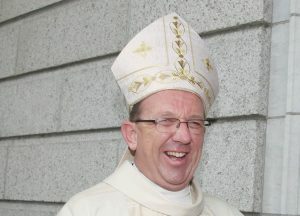 There are 550 pilgrims travelling in the diocesan pilgrimage led by Bishop Deenihan, assisted by Bishop Michael Smith, the Bishop Emeritus of Meath. The Cork-born clergyman said the annual journey to the Marian shrine in the south of France brings together people from all over the diocese in an experience of grace, joy and healing. “Our pilgrimage is only possible because of the generosity of so many people,” he said in Lourdes, in a message to the faithful back home in the Royal County and elsewhere in the diocese, which includes parts of Westmeath and Offaly. “It is a time of blessing and grace for our entire diocese. Please keep the pilgrims in your prayers as they carry with them the intentions of so many people and lay them in the hands of Our Lord through the intercession of Mary. “The grotto in Lourdes, the water, the baths, the processions, the Eucharist, the candles, the music, the gathering of people from all over the world, are all part of this special place where pilgrims experience the healing presence of God and where hearts are uplifted. Our Lady first appeared to St Bernadette on 11 February 1858. During a series of apparitions the Blessed Virgin told the young French girl, “I am the Immaculate Conception” – thus prompting one of our greatest Catholic devotions.